I’m writing tonight from our car. We are on a very long journey with our three children in the back of the van on our way home from Omaha, NE. We went to Omaha to baptize our youngest. Our surprise baby knitted within me by His hand and revealed to us like a flash of heat lightning on a summer evening. 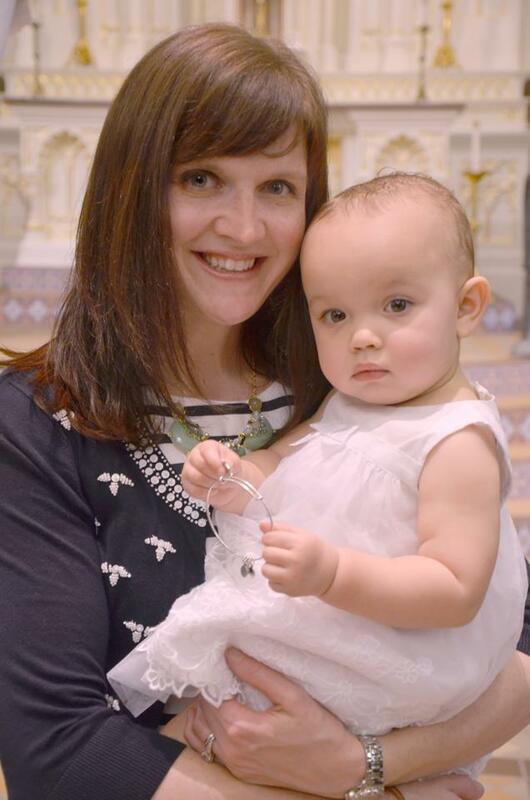 For our family, a baptism is a ritual that is sacred. One that represents our commitment to our faith in Jesus Christ and our intention to plant the seeds of a life with Him in our children. The church we return to in Omaha is a home for my husband and I. Although my faith tradition is evolving and changing in a way that puts Jesus at the center, I find that this particular ritual is deeply rooted within me. I wish that I could say that I have my faith journey all figured out. I envy those that are unshakable in their knowledge of scripture and convictions on all things biblical. Instead, I’m the middle school phase of my spiritual growth. I’ve got zits, a bad haircut and I’m just trying to sort out who I am and where I fit in. For the people of Israel, it was enough to just follow the cloud and remain in their tent under the flame. If I look for my clouds and fire will I find them? When I stepped into Sacred Heart church this morning I was safely under the cloud. I laid a foundation there ten years ago and now my house stands tall. I planted a seed of obedience and commitment to Jesus there, in that place. Today, my fellow Israelites welcomed me back into their Omaha tent. They celebrated the wonder of this beautiful new life with us. All along I’ve been struggling to reconcile my transition from the Catholic tent to a more Christ centered Christian tent. I’ve spent a few years trying to clear up my spiritual acne and get a better biblical look. I anticipated a real feeling of dichotomy, a feeling of separation and the discomfort of being non-commital. What I experienced was grace. The power of the Holy Spirit is here and surprisingly it was also there. I’ve spent so much time worrying about my role in my spiritual maturation but Moses gave me a little nudge today. I got to celebrate a Passover, a ritual, a sign of obedience to our Heavenly Father. It wasn’t a drudgery. I didn’t check my watch to see when it would be over. It sounds like the Israelites didn’t either. They “abide-ed”, they were content to rest in the promise of guidance and protection. Are we too busy to abide? Can I trust the Lord enough to guide me on his time with the rest of my Israelites? Lord, give us patient hearts and minds this week. Help us to hear and see you this week.